Throughout the weekend there were insane amounts of Magic action coming from all over the Georgia World Congress Center. The sounds of the nearby football game was drowned out by the sounds of Magic. Here's a look at the top stories of this weekend in Atlanta’s Ixalan Standard Grand Prix. Veteran’s Day was yesterday in the United States—a day dedicated to celebrating the veterans of the American wars, and all who served and serve in our armed forces. It’s a weekend of both solemn remembrance and thanks. For a few Navy members, it was a thankful Magic weekend. Stationed in King’s Bay, Georgia a group of friends who usually play together underwater. “It’s really cool underwater," Matthew Davis said. At the time he was X-2, and heading into the late stages of the tournament. Though he’s a fan of being a submariner, there isn’t always a lot to do. “We do these shifts—working 8 hours, then 8 hours of maintenance, then 8 hours of sleep. That’s the rotation." But he continued, “I was ship’s damage control petty officer—making sure if an accident happens can respond," and because of this, when things weren’t going wrong, he’d have some downtime. He and his fellow submariners filled that time with Magic. 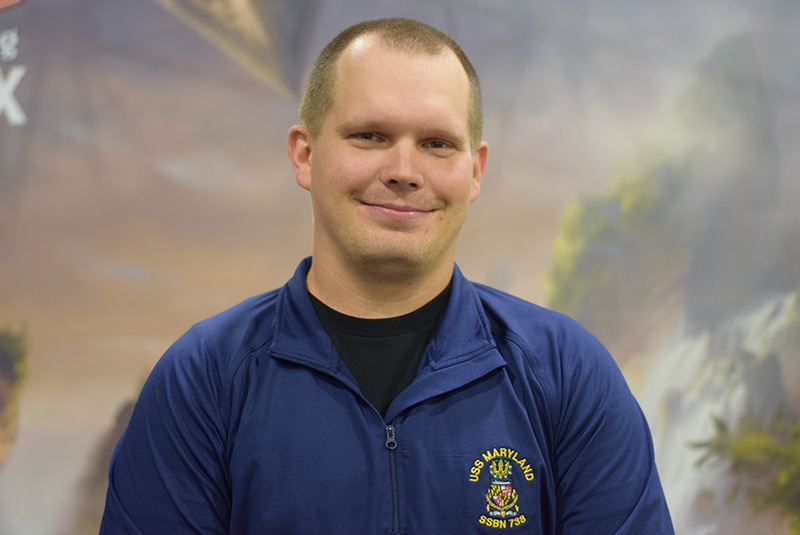 “We mostly play Commander—it’s hard to keep up with Standard," he admitted. “I mean, “I mean, we kinda get emails—but it’s super filtered, super-encrypted, so it’s hard to keep up." But when they surfaced, and caught up on Ixalan Standard, it turns out they can sling some mean cardboard too. Though Davis, lost his win-and-in for Top 8 in the last round, he was proud of his finish. And he wasn’t just proud of that, after I thanked him for his and his Navy compatriots for there service, he mentioned something else he was proud of. “Yes, I love [being in the armed services]," he said. “I’m proud of it. It’s given me the opportunity to provide for my family the way I needed it too. And I’m thankful for that." He did admit to a few perks as well “Also, I did buy a hot rod. I bought stupid things too." He chuckled. So even though he didn’t make the Top 8, he had quite the weekend. And on note, he wanted to add: “Thanks to my wife for letting me come and thanks to Cody for helping me out." It was a slightly sad sight during the Top 8, even though it would for many be a time of rejoice. Even though (20) Corey Baumeister broke through into the elimination rounds, he had to leave behind his brother (10) Brad Nelson, who lost two consecutive win-and-ins. This was important for them, as it would have continued an absurd stat they already reign supreme over. 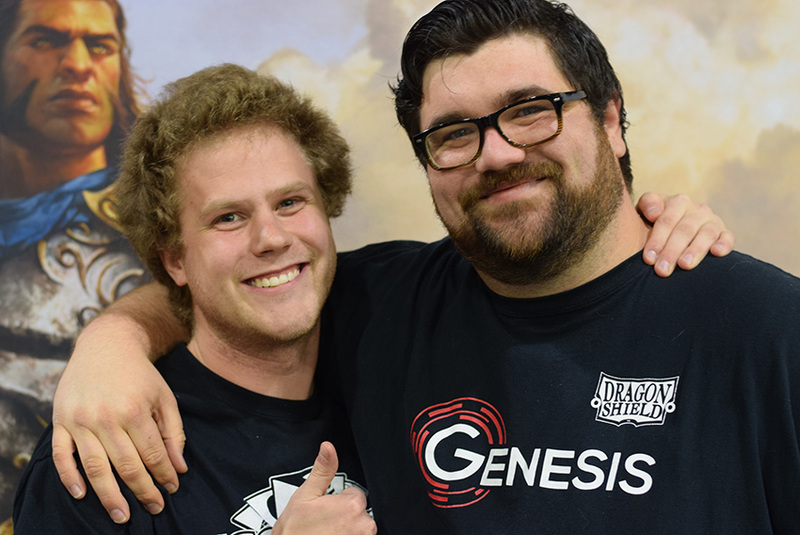 The brothers have already Top 8’ed two Grand Prix together, and this year! Even though (10) Brad Nelson is happy to be with his brother (20) Corey Baumeister, you can tell the smile is a bit forced. 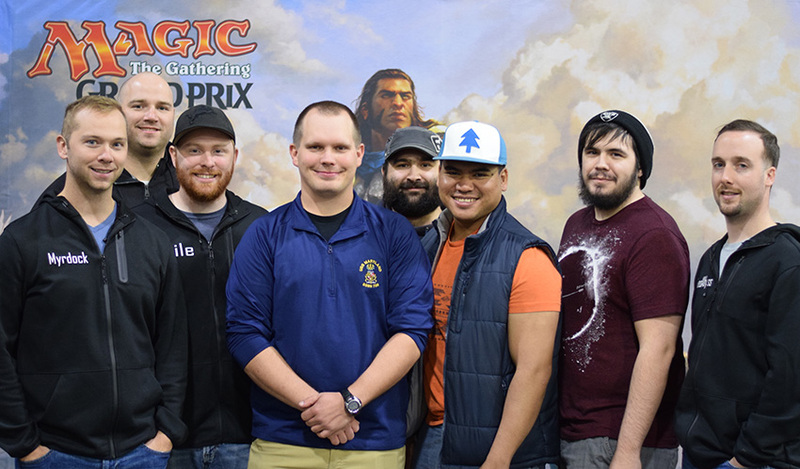 But despite the two being unable to one-up themselves, Baumeister added to his own crazy streak—he’s now Top 8’ed four—four—Constructed Grand Prix in a row. And that makes five for the year. It’s pretty insane. For years Nelson has insisted that his brother is better at the game than he is—maybe the young buck is starting to show the rest of the world. They both played an updated version of Temur Energy which they loved. Playing three Confiscation Coup, they shored up the touchy Ramunap Red match-up loads. Stealing Hazoret the Fervent completely changes the nature of the match. “If I had another day to test," Nelson said, “I would have tried the full four Coups." You heard him, all. Have at it. Even though Nelson was in poor spirits at the end of the day, he just needed a little love from his brother and he was right as rain. 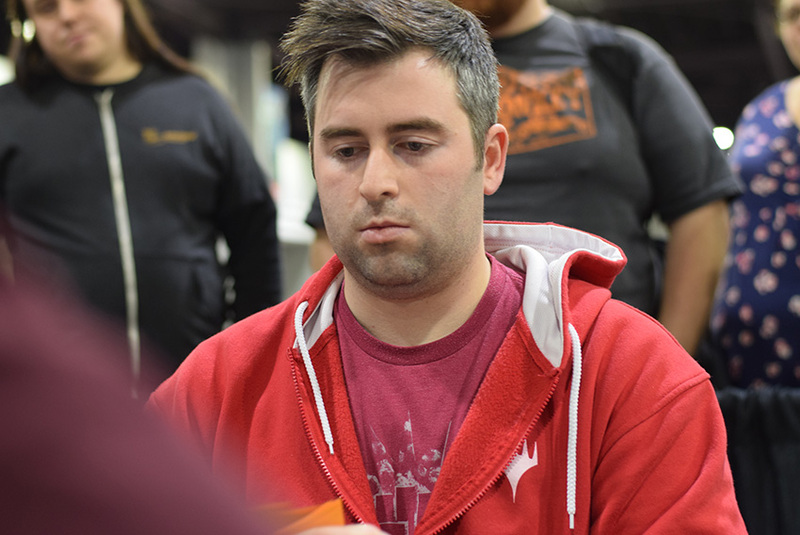 Pro Tour Hall of Famer member Ben Stark is often lauded as one of the best Limited minds in the game, but his Constructed deck building often gets overlooked. The Floridian has shown time and again that when you give him a format, he can figure out how it ticks, and how best to attack it. What he did this weekend to Ramunap Red, was reminiscent of what he did a few years ago at Grand Prix Memphis, where he also Top 8ed. He took an aggressive red deck, and turn it upside down, leveraging the card advantage engines and grinding ability to flip unfavorable matches into unexpected triumphs. When everyone saw his brew this weekend—which took him all the way to the Finals—it was a hard nut to crack. No one quite knew was it was doing. Was it even Ramunap Red anymore? It seemed to confuse some other people as well—as Pat Cox said on Twitter. Despite leaning on a card Pat Cox didn’t even know existed—Dunes of the Dead—he breezed through the tournament all the way to the finals. And used cards like Treasure Map, while minimizing Hazoret the Fervent—a normal staple—to upend one of the most-played decks in the format, Mono-Red. Definitely head to the Top 8 decklists to see his beauty, eventually named “Desert Red” in action. 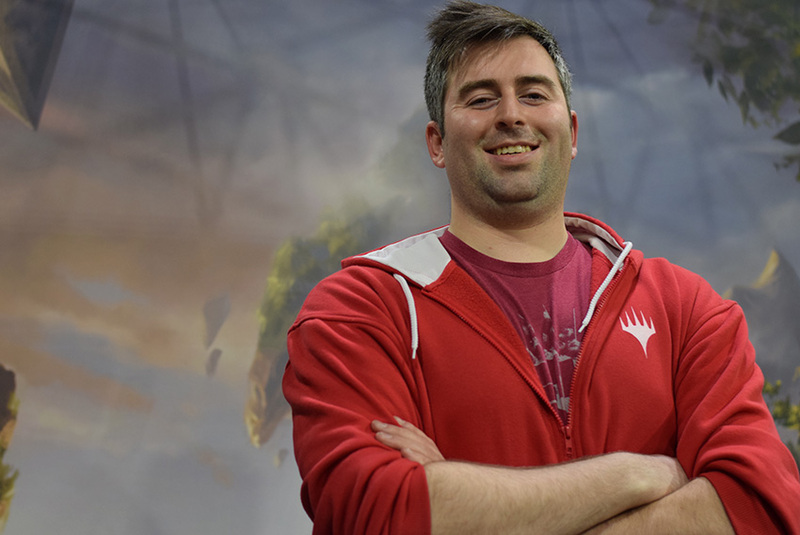 A week ago, New Hampshire judge Alex Lloyd was on White-Blue Approach—the go-to control deck in the format, with a strong combo finished of Approach of the Second Sun. But after its performance was lacking, Lloyd went back to the drawing board and added a third color, black, to shore up some trouble spots. The Aggro match up got better. Much better. Better enough to take down Ben Stark’s red deck in the finals to capture the top prize. In the final game, after Stark mulliganed once, the red-laded player when burn face, burn face, and tried to race. Though Stark ran out of gas, he was just clawing himself back into a victory when Lloyd laid Regal Caracal out of the sideboard and wrecked Stark’s accent. That wasn’t the only great moment he made in the Top 8. With his back against the wall in the quarterfinals, Lloyd hit a series of topdecks that were simply unreal. He needed to counter a Chandra, Torch of Defiance, and perfectly Opt’ed into the Disallow he needed. Then immediately drew the Fumigate to not lose on the spot. And then drew not one, but two Regal Caracals. Which bought him enough time to win with the Approaches. It was amazing. Though he caught some flack about how good the draw was, commentator Jake Van Lunen came quickly to his defense. “For what it’s worth, he only needed runner-runner; he happened to get runner-runner-runner-runner." Additionally, Lloyd said that if he won the Grand Prix, he would buy a case of Unstable, the upcoming non-tournament-legal sequel to Unglued and Unhinged—and take a whole week to draft it with friends. He called it “Unstable Boot Camp." And when he beat Stark in the Finals, the first thing Lloyd did was stand up, clap, and yell “Unstable Boot Camp!" It was an amazingly satisfying moment, and a great way to cap off the weekend.